Jordy Liz Blogs: Ten weeks. We had our first appointment yesterday. Your dad came into the room with me, holding his own as best a guy can do in a women's clinic. They whisked us away to the ultrasound room and before I could even get comfortable on the crinkly paper, there you were on the screen. It was you - this you I've been feeling and thinking about for the last umpteen weeks. You were finally so much more real because there you were. Everyone told me you would look like a bean, but there was no bean. There was a head, a body and two little arms with hands. I could see them so clearly. And next thing I knew, your heartbeat came through. A strong thumping of lines across the screen sealed the deal for us as we looked at each other and realized how real all of this was. The doctor said you were perfect and beautiful. Everything looked perfect and beautiful. Those words were so encouraging after waiting weeks to make sure everything was in fact perfect and beautiful. And then they measured you. Your planner of a mother has been tracking you day by day and came into the appointment at nine weeks, two days. Copy that? 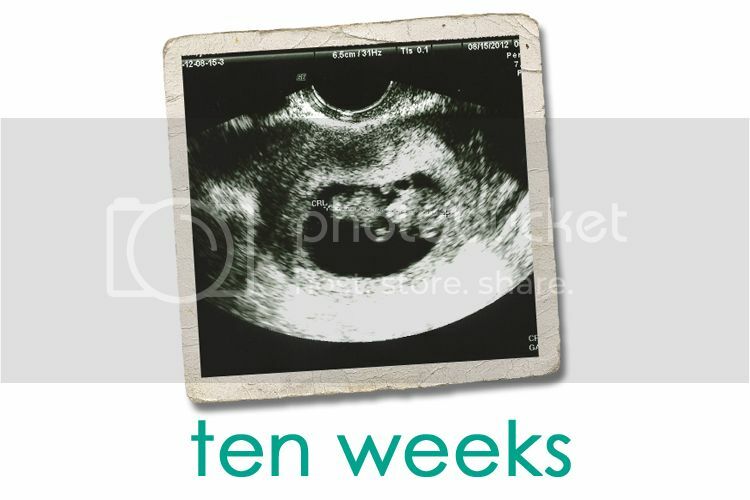 Turns out, you are ten weeks, two days. An entire week ahead of the game. I was thrown off for the rest of the night. Your due date changed, my plans changed and everything made much more sense all because of that one week. I was wondering why I had found out so early, why I was feeling nauseous days before I could even test for you. I was wondering why the nausea was already starting to wear off. I was wondering why you looked like so much more than a bean on the screen. You have been a surprise through this entire process, from the moment we found out about you to the moment we found out you were here well before we knew it. I know God is smiling down that you are already making your Type A, organized, control freak mother question dates and plans and the calendar. I need it, though. God knows I need it. And aside from the fact that the nausea has been more at bay this week but my energy level is at an all-time low, I am so blessed to know you're in there, tucked away safe and sound.